The semantic underpinnings of the News360 app, which works on iPad, Android, Windows Phone, the PlayBook and now the Web, are a key differentiator for this application. Previously, the company leveraged those smart algorithms to surface the most important news in categories like World, U.S., Politics, Business, Tech, Crime, Sports, Arts, etc. But now, that same technology is used to better personalize your own news reading experience. There are around 700,000 different entities known to the News360 semantic engine, and, explains News360 CEO Roman Karachinsky, each person typically has 5 to 10 “persistent” interests. 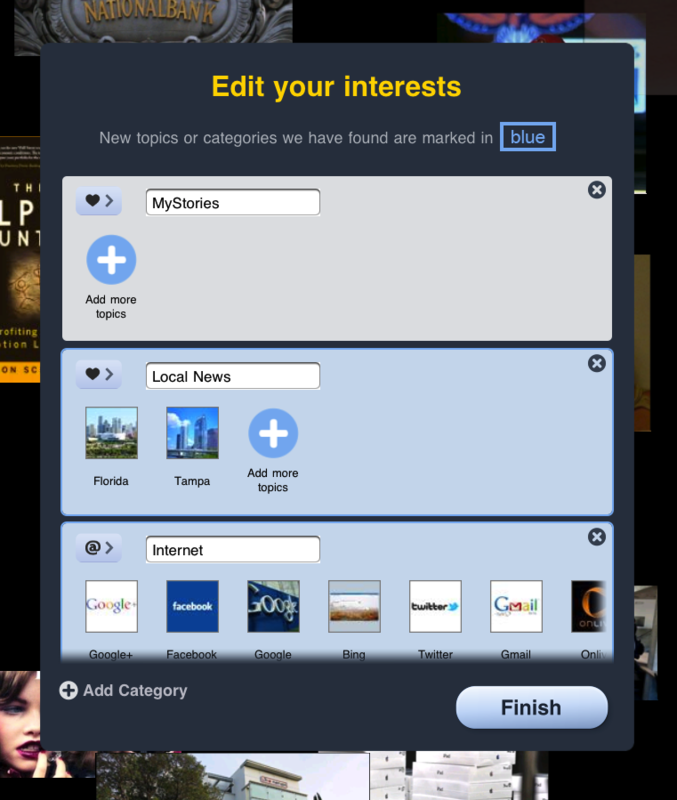 These interests are automatically discovered for you by the app, after delving into your social Web activity. To determine what these interests are, the app doesn’t just pull from one network, or one dataset, like your “likes” on Facebook, or your Twitter “favorites,” for example – it looks at everything…given permission, of course. In addition to Facebook likes, the app reads your Facebook profile data, sees what you comment and share and examines how you interact with content. On Twitter, it looks at your bio, your lists, your tweets and your favorites. On Google Reader, it knows what you share, what you star, what you read and what clicked through to. And on Evernote, it looks at which web clips you saved, especially those that are news-related. 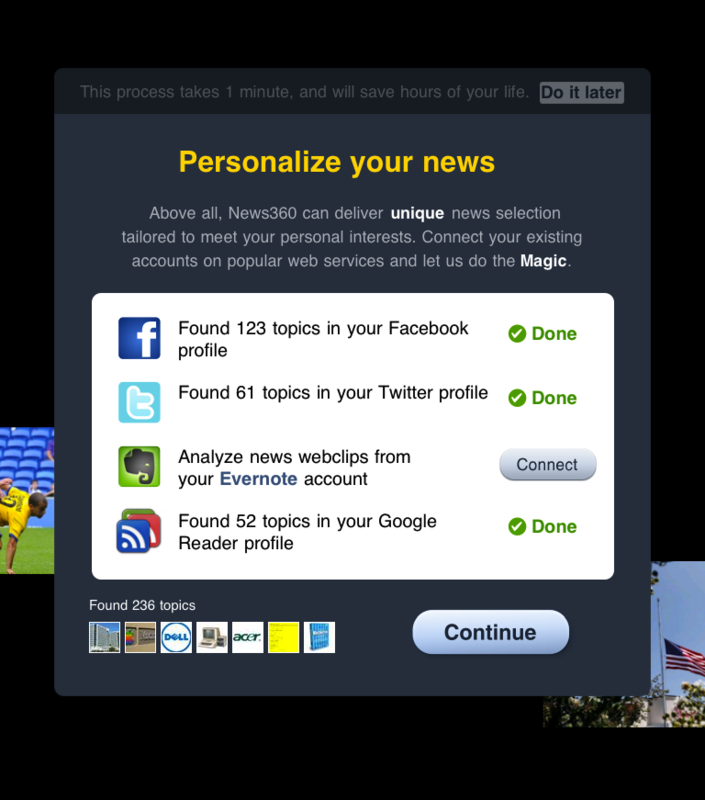 Personalization isn’t News360’s only trick, it’s just the newest one. 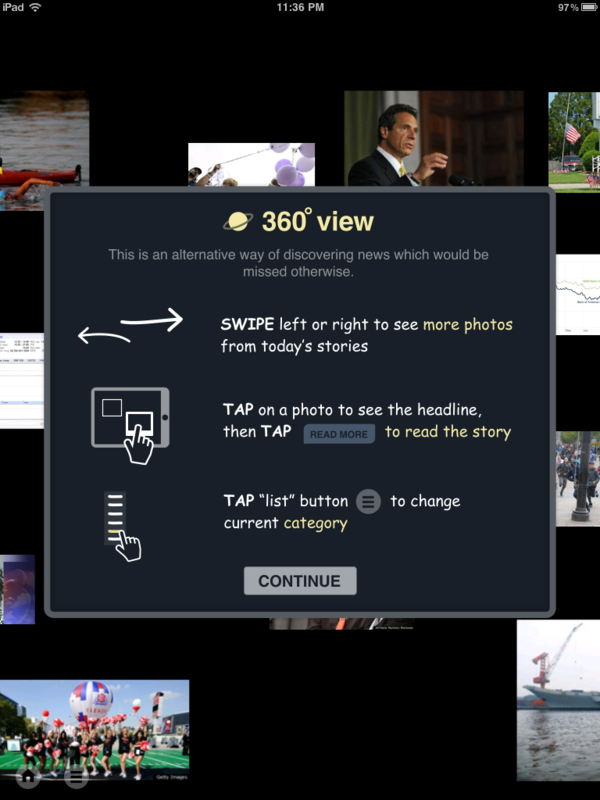 The app’s name derives from its main selling point: a “360-degree” view of the news. What that means is that News360 presents you with aggregated coverage of the news from multiple news outlets, allowing you to move from one story to another for well-rounded understanding of the topic being reported. It also lets you browse the news via photos, which is still more palor trick than practical. As a voracious consumer of information, however, the “360degree” feature has a certain appeal for me – despite its current implementation. It’s not that using the “360degree” view in the app is hard, it’s just that I’m not all that impressed with the design. When up against powerhouse news readers like Flipboard, for example, which has to be one of the most elegant news-reading experiences to have ever emerged on iPad, there needs to be just as much focus on the front-end design as on the geeky data-crunching bots behind the scenes, I feel. Above: What is that font?! Besides, Flipboard has been steadily implementing the technology it acquired from a semantic startup known as Ellerdale to improve its own personalization and overall “smartnesss.” And Flipboard Co-Founder Mike McCue told me recently that a major personalization upgrade was coming to the app soon. With that in mind, it may not come down to a choice between data (News360) and design (Flipboard) at all, it may be a choice between data…or data and design. And in that battle, I’m not convinced News360 could win.